The Sitges Film Fest, located in the Catalonian coastal town of Sitges in Spain, is one of the largest film festivals in the world. This past year was the 44th anniversary and it ran from October 6th through the 16th. The film festival specializes in fantasy, science fiction, and horror movies. Recently, efforts have been made to introduce animated films into the competition. Many other film festivals exist worldwide, including the Toronto International Film Festival, that premiered on September 10th for its 36th anniversary. This year the Toronto Film Festival featured an animated short film that truly wowed and captivated the audience. Due to its success the film, "A Letter to Momo" was featured at festivals in Spain and South Korea, including the Busan International Film Festival, which ran from October 6th to the 14th in Busan, South Korea. The Busan International Film Festival focuses on outstanding works of animation, documentaries, and experimental films. "A Letter to Momo" was written and directed by Okiura. The animated film is set on a small island in Seto Inland Sea and tells the story of the love within a family. After her father dies in a shipwreck, Momo is devastated as their last meeting was a fight. She and her mother leave the city and return to their remote fishing village. 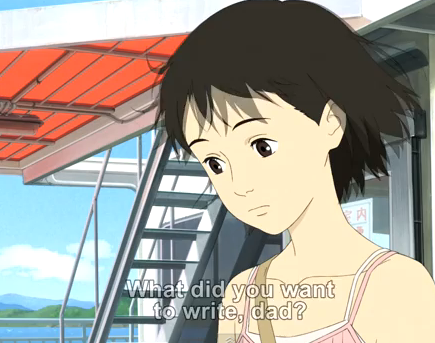 She finds a letter her father had started to write her, simply stating "Dear Momo". She is lonely and isolated. She finds an old book in the attic, then starts seeing mystical shapes around her. She gives herself up to the process of enlightenment and this puts her on a path with purpose. The heartwarming anime will be released nationwide in Japan in Spring 2012. The film was created with a traditional handmade animation style and the result is visually stunning. Great craftsmanship. Below you can find the movie trailer.